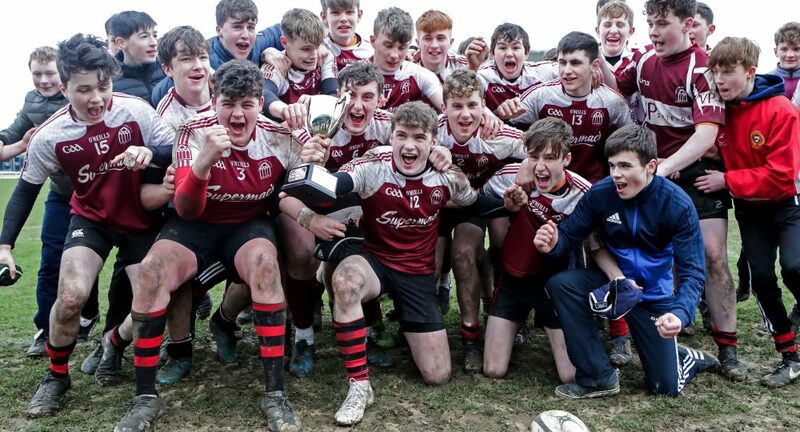 Presentation College Athenry recorded a remarkable Schools Cup double with a commanding win over St Jarlath’s of Tuam in the Sportgrounds, running in four tries on their way to claiming the Junior Development crown. Pres played into the wind for the opening half but they had no trouble whatsoever imposing themselves on St Jarlath’s. The trend was set as early as the second minute as Pres centre Shea Hennessy cut free in midfield and swerved his way through to dot down under the posts for the game’s first try. Jarlath’s showed some ambition as they tried to run the ball but they were overwhelmed by the pace and physicality of the Pres defence. 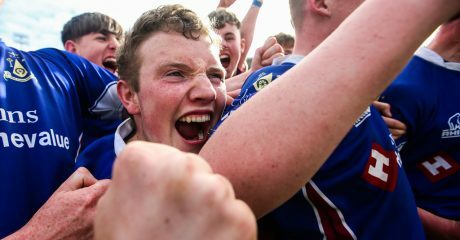 The Athenry boys had their second try on 20 minutes when Ruairi Collins intercepted a Jarlath’s pass out wide and raced clear to score, just about evading the chasing Daniel Concannon. Two conversions from Kelvin Langan had helped Pres to a 14-0 lead and the scrum-half got in on the try-scoring act himself with five minutes of the half remaining, peeling off the edge of his pack to dive over in the right corner. That score left it 19-0 to Pres as the sides left the field for the interval. 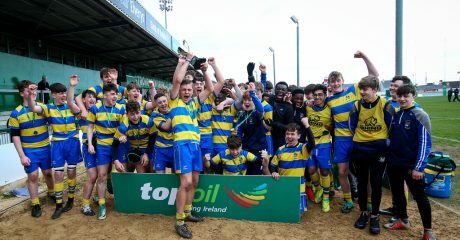 Jarlath’s, to their credit, upped their game considerably after the restart and they had the try their efforts deserved on 42 minutes. Good work from the pack allowed flanker Eoin Sweeney to power over in the right corner and trim the deficit back to two scores. But Pres responded almost immediately, Langan nailing a penalty from 40 yards after Jarlath’s went in off their feet. 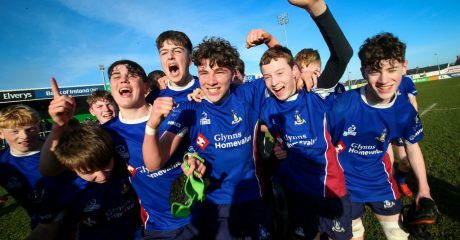 Another penalty from the dead-eye Langan five minutes later extended the lead to 20 points and when Collins ran in his second and his side’s fourth try in the dying minutes the seal was set on a remarkable junior-senior double for the Athenry school. PRES ATHENRY: Conor McElwee, Luke Martyn, Ruairi Collins, Shea Hennessy, Kevin Maher, Evan Connolly, Kelvin Langan; Adam Johnson, Darragh Carty, Patrick Freaney, Cormac Feeney, Cathal Flanagan, David Daniels, Shane Regan, Darragh Murphy Coyne. Replacements: Jack Waldron (for Johnson 36), Adam Fitzgerald (for Daniels 44), Rob Noone (for Regan 44), Luke Forde (for Maher 55), Lorcan Budge (for Martyn 55), Owen McGuinness (for Carty 55), Conor Fahy (for Flanagan 55), J Naughton (for Langan 55). 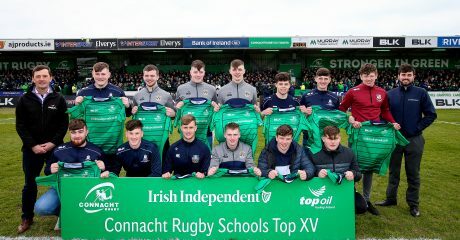 ST JARLATH’S: Dylan Joyce, Daniel Concannon, Ryan Lenehan, Cian Clancy, Conor Mahoney, Carl Ward; Juan Riela, Sam Heneghan, Fiachra Costello, Daithi Gleeson, Darren Fahy, Ian Spellman, Eoin Sweeney, Niall McCabe, Conor Heneghan. Replacements: Padraig King (for Heneghan ht), Tomas Carney (for Mahoney 43), Darragh Glynn (for Gleeson 44), Liam Keaveney (for Riela 54).